Spotted by Sir Iain Chalmers, who generously sent me a copy. It was included in the article Under pressure. The latest articles in Medline is powered by an RSS feed. The news is powered by Google news. At the foot of the page is the ability to do, easy, live searches of relevant material. I was reviewing a number of e-mails we’d received recently. Shortly afterwards Google announced their Google Maps venture. This allows users to easily create custom maps. Putting two and two together I got TRIP around the world, which is simply a list of contacts we’ve received since March 2007. Click here to view the map. If you want to feature then contact us via this form. As well as saying hello and where you’re from feel free to let us know your thoughts about TRIP. For instance how you use it, what you use it for, any improvements you’d like to see. Also, let us know if you’re happy to use your name or simply post it anonymously. Interestingly, the TRIP paper “Using the Turning Research Into Practice (TRIP) database: how do clinicians really search?” was added on the 20th April. So there is a chance (albeit remote) that the TRIP paper was the 17 millionth! A while ago I worked with the Centre of Evidence-Based Medicine (Oxford) on an evaluation of TRIP**. The review was extremely helpful and TRIP benefitted greatly from it. Anyway, the evaluation has been published in April’s Journal of the Medical Library Association (JMLA) – Using the Turning Research Into Practice (TRIP) database: how do clinicians really search? ** Thinking about it, the actual evaluation was around two years ago and since then we’ve had one major upgrade and another one due – perhaps we need to think about having another one! It’s always nice to be asked to give presentations, to talk about TRIP, Q&A and related topics. A recent invite came with many apologies as they weren’t sure who to contact, if it was appropriate to ask etc. I like to think of myself and TRIP as being very approachable! So, if you have an event and want me to present, just let me know via the Contact Us form on TRIP. In the post of last Thursday I highlighted the new ‘conclusions’ feature. I thought I would share more on the development process! The development process starts with ideas. We tend to have a number of in-house ideas for where we want to go. These can come from our own experience of using TRIP, developments in other areas of search, or by reading research papers. A good example of the latter being my desire to have snippets on TRIP after reading a research article produced by Microsoft (click here for details). As it happens I don’t like the snippets, hence insisting on the ability to switch snippets on and off. These in-house ideas are supplemented by a number of ideas suggested by users. We don’t get a great deal (which may be a good sign) but enough to make us stop and think. The next step is to decide the available budget and go and see the excellent Sequence, who have been the web-developers of TRIP for around 5 years (ever since I stopped producing it myself). I go and see them with a wish list. I tend to understand the way they work and have a rough idea of costs before I see them! Once we’ve agreed costs and scope, a project plan is drawn up. This typically has a delivery time of 6-12 weeks, depending on the size and complexity of the changes. I then leave Sequence to get on with things, occasionally nagging them, occasionally altering the plans – I think they’ve come to expect it. What they deliver first is a development version for me to look at and test. Frequently grim to look at but nonetheless useful for me to see if things ‘feel’ right. They also can send me designs to check out. At the foot of this post are two examples. 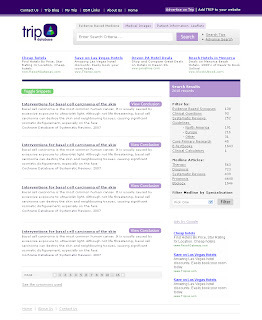 The first is a screenshot of the latest development site. Messy, but you can see the alteration to the Google Ads (two versions for some reason, there will be only one in the live version), you’ve got the snippets (and the toggle snippets on and off button), an RSS feed button, an ‘i’ button (which reveals the conclusions), a symbol highlighting PDFs. Below that is a design, the layout is good, but I’m not a big fan of lilac/pink. So Sequence will alter the colour scheme and then merge that look and feel with the functionality of the development site. We’ve just got to review the implementation of the ‘conclusions’ feature on TRIP. This allows users to view the conclusions from various documents that have conclusions (so not all). Click on the image below to see how it’ll look. I think this will be a very popular and powerful new feature!